As of late, popularized American Evangelicalism has routinely divided itself around adherence or rejection to the Calvinistic acronym TULIP. This has particularly been true of the youthful resurgence in adherence to a Calvinistic soteriology. For some, having an opinion on Calvinism (also called the “doctrines of grace”) became a necessity for the theologically minded. As a former Reformed student, Jordan Cooper understands this climate. As a convert to Lutheranism, he also understands the regrettable negligence to the chief reformer, Martin Luther, and his considerably solid theological tradition. 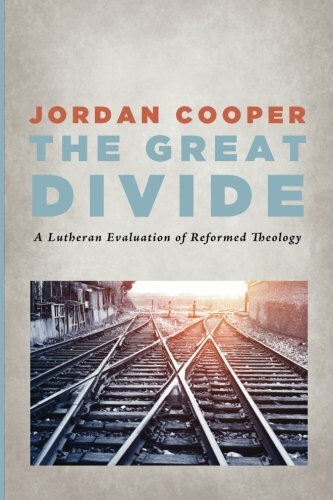 In The Great Divide, Jordan Cooper sets out to address this regrettable exclusion among American evangelicals by evaluating Reformed theology through the lens of Lutheran theology. In three parts, Cooper provides clear and articulate delineation of the popularized Lutheran and Reformed traditions. With an evaluation of TULIP (chapters 1-3), worship (chapters 4-6), and salvation (chapters 7-8), Cooper covers a lot of ground in a small amount of time. This occasionally requires that nuanced positions of the Reformed faith go unaddressed or simply flattened out. Some Reformed readers may feel their particular articulation of a Reformed doctrine or its essential nuance goes unaccounted. However, Cooper does a fair job of presenting the Reformed majority and highlighting the locations of disagreement with Lutheran dogmatics. Cooper on occasion exposes false presentation of Luther theology (e.g. Forde's popular "Lutheran" sanctification). He presents solid arguments for Lutheran positions that have minority adherence within Reformed circles (e.g. universal atonement, historical liturgy, and strong sacramental emphasis). With a subtitle of "A Lutheran Evaluation of Reformed Theology," The Great Divide spends a significant amount of time defending Lutheran views from opposing Reformed critiques. Occasionally excessive, these pages contain essential points and exegesis that highlight the points of disagreement. He highlights Reformed positions that while not widely held provide the strongest examples of disagreement (e.g. Gaffin on justification/sanctification through union with Christ and Mark Jones’ Antinomianism). Though Reformed responses and clarification will certainly re-muddy the lines of these disagreements, any future interaction between the traditions should achieve deeper understandings of the genuine disagreements. In conclusion, Jordan Cooper's The Great Divide is an important book for young theologians moving forward. The popularity of Lutheranism will only increase as extensive Biblical studies continue among conservative Christians. Current Calvinists will appreciate this introduction through contrast to Lutheranism. Lutherans also will benefit from this evaluation. Still, many will need to follow up with deeper dialogue on Reformed nuances and exegetical understanding. Editor's Note: More in-depth interaction can be found in this blog series.